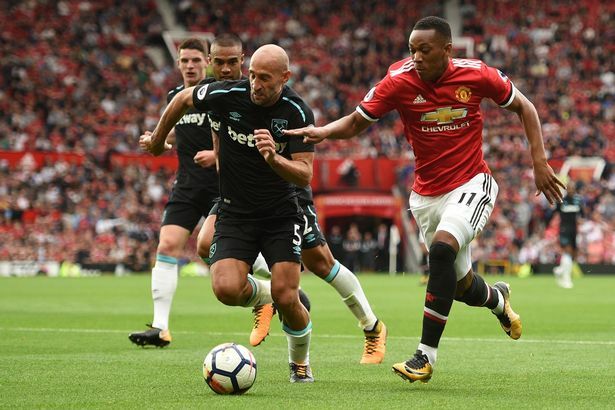 West Ham fell today at Old Trafford 4-0 in the final match of the opening weekend of the 2017-18 Premier League season. Slavin Bilic, despite his popular summer transfer additions, came to Manchester without a few of his more dependable weapons, as Manuel Lanzini, Michael Antonio, Andy Carroll, and Cheikhou Kouyaté were unable to play today due to injury. For José Mourinho, he came to the ground with a wealth of options, as would be expected with Manchester United’s wages, including summer additions Nemanja Matić and Romelu Lukaku. Both United additions earned their wage for the day as Lukaku opened up the scoring midway through the opening half after Matic took possession in the middle third and moved it to Rashford who moved it towards the penalty area, passed to Lukaku who scored as the ball posted off into the net. The Hammers had few chances in the opening half, but in the final moment of added time, they showed a bit of optimism when Javier Hernandez crossed to Noble who dropped back to a free Fernandes, but De Gea had a strong block to end the half. The second half saw Lukaku pick up where he left off, as Mkhitaryan’s free-kick found Lukaku and his header was beyond Hart’s reach. With a two goal deficit, and a midfield that couldn’t maintain possession, Bilic called on Diafra Sakho and Declan Rice. The move seemingly stabilized the midfield for much of the remainder of the half. During the second half, there were multiple times West Ham was under fire, but the new signings Joe Hart and Pablo Zabaleta showed great work rate despite, not much help around them. Late in the half the wheels really came off as Mkhitaryan found Martial, who found the corner of the goal. The 87th minute goal wouldn’t be the end. The final embarrassment came moments later as Paul Pogba scored from range in the 90th minute. During the three minutes of added time, West Ham managed to milk the clock and walk away with a shameful result in the season opener. It can be said that Manchester United is a stacked squad with weapons all over the pitch, and that West Ham has some missing pieces, but the poor defending and lack of purpose in the middle third of the pitch from the West Ham midfielders made Chicharito’s debut a non-event. On the first weekend of the season, after such a positive summer transfer window, West Ham is at the bottom of the Premier League table. Slaven Bilic, in the final year of his contract, has to work some wonders keep his team believing, and keep his fans supporting him after this match. A short week and a trip to St. Mary’s will be the opportunity to turn the ship around. After today, that opportunity can’t come soon enough.